Since pull-out stops prioritize through-traffic, including through-moving transit, they are most useful where flow is a priority or where in-lane stops would be problematic. These include local stops along a route with rapid or express service, time-point stops, and other stops with long dwell times. 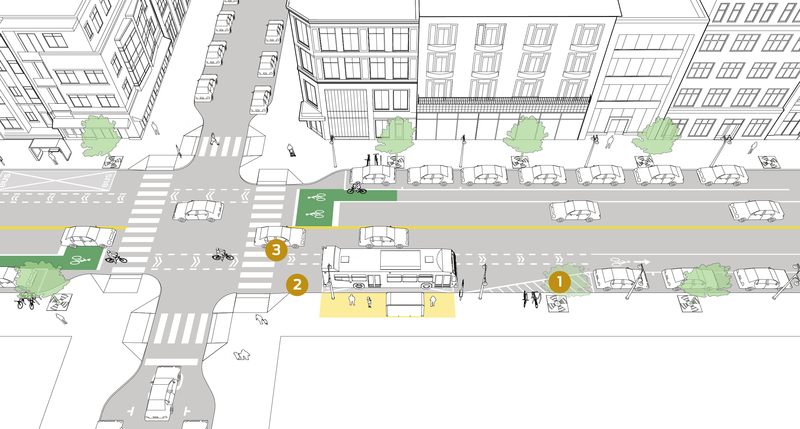 Managing bus-bike conflicts and providing sufficient sidewalk width are specific needs when using this stop configuration. At queue jumps and queue bypasses, buses use the curbside lane to progress through congested intersections and service stops on the sidewalk. At time points or end-of-route layovers, pull-out stops create space for the bus to wait out of traffic flow. Layovers are occasionally used for streetcars. On streets with low-frequency bus service, high target speeds (≥35 mph), or where in-lane stops are not geometrically feasible, sidewalk stops provide a safe boarding space with limited expense. Pull-out stops consume somewhat more time than in-lane stops, since buses exit the travel lane completely, pull to the curb for passenger boarding and alighting, and then merge back into the flow of traffic. Sidewalk stops may create conflicts between through-moving pedestrians and alighting passengers when the bus is dwelling. Sidewalk width standards vary by municipality, but 4’ is the ADA minimum width requirement. 6’ is a common standard sidewalk width requirement. Because 8’ width is required for the boarding zone, sidewalks at stops should be at minimum 8’ at stops, though at least 10’ is preferred, and 14 feet is required where shelters are placed (4’-foot clear path along the curb, 4-foot shelter width, and 6-foot sidewalk width). DDOT Sidewalk Installation Guidelines and Policy. District Department of Transportation (2015). 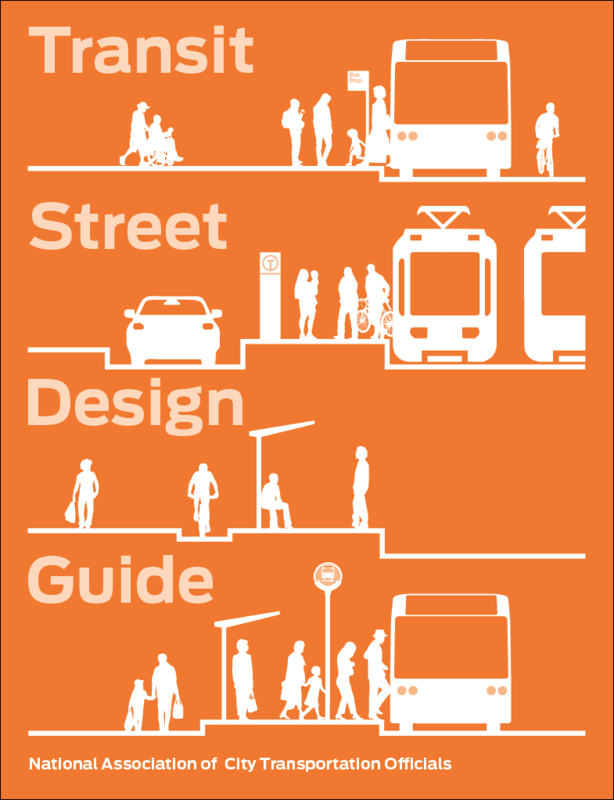 Street Design Manual, 2nd Edition. New York City Department of Transportation (2013). Streets and Sidewalks Maintenance Standards. Department of Public Works, City & County of San Francisco (2007). Shelters, seating, and other stop furnishings should be provided in the street furniture or curb zone of the sidewalk, leaving a wide enough clear path to accommodate pedestrian through-traffic. The through zone should be 8–12 feet wide in most downtown or commercial streets; see the Urban Street Design Guide for sidewalk guidance. When curbside stops are partially blocked by illegal loading or parking, transit vehicles may have insufficient space to transition, increasing the likelihood that passengers will be forced to board from street level and that the through-traffic lane will be blocked. Even when provided with entry and exit tapers, buses may not be able to pull close to curb, making boarding more difficult. An accessible boarding area, typically 5 feet long (parallel to the curb) by 8 feet wide, must be provided to permit boarding maneuvers by a person using a wheelchair (ADA Std. 810.2.2) (see page 67). 10 feet of width is preferred. To accommodate smooth transitions, sidewalk pull-out stops are typically 90 feet long when located near-side, and 100 feet when located far-side. Buses can be equipped with enforcement cameras to discourage lanes from being blocked. “Lay-by” configurations, where transit bays are carved out of the sidewalk, should be avoided on most streets, and applied only with very wide sidewalks (typically over 30 feet), or if the rest of the sidewalk has been widened but in-lane stops are not feasible. When the pull-out stop is configured as a queue jump, install either a transit signal head to facilitate the queue jump, or a green signal with an extended hood, shielding it from the view of general traffic. Transit signal heads require a design exception for use with buses, and are evaluated on a case-by-case basis. Joseph Barr, et al. Designing Bus Rapid Transit Running Ways. American Public Transportation Association, Washington, DC: 2010. This configuration is applicable where a neighborhood street crosses a larger street that may or may not be stop-controlled. If two similarly sized streets intersect with moderate to high traffic volumes, traffic signals with low-speed progressions may confer greater benefit to users. 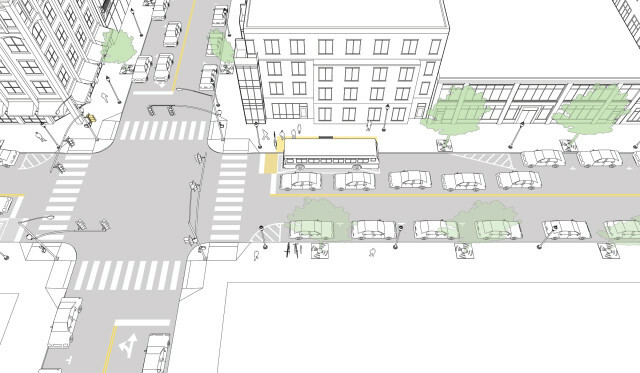 At signal-controlled locations, the near-side pull-out stop may be implemented as a queue jump—the bus pulls into the stop, completes boardings, and then receives an advance or extended green phase through the intersection, while general traffic is held. In stop-controlled configurations, the bus may pull into a near-side stop, allowing traffic behind to pull forward to the stop line and proceed while the bus is dwelling. When the bus completes boarding, it pulls forward and proceeds. Where a small neighborhood street intersects a larger corridor or destination street and high transfer volume between intersecting routes is expected, the near-side stop can be paired with an adjacent far-side stop on the cross street, facilitating easy and safe transfer. Locate the bus stop at least 10 feet from the crosswalk to ensure pedestrians and drivers have adequate sightlines. 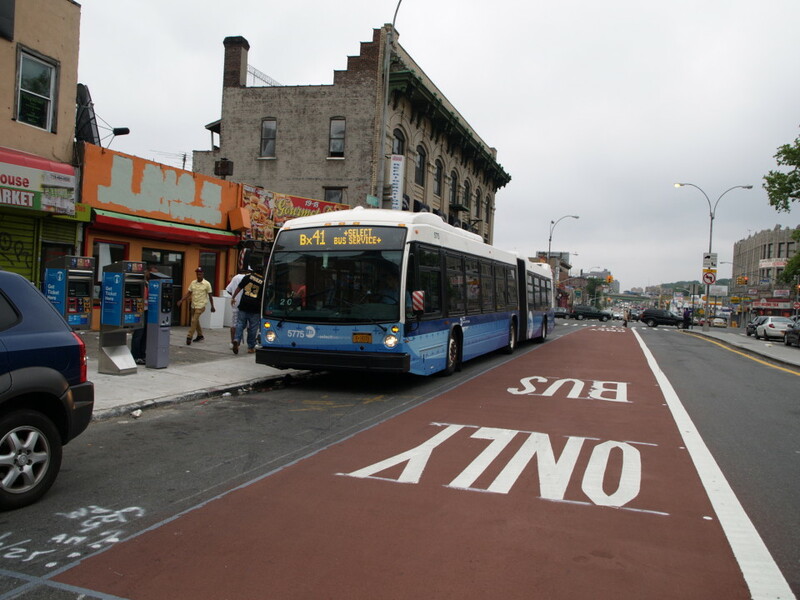 Bus stop zone must be wide enough to ensure buses do not extend into adjacent lanes. Exit taper is typically 25–30 feet. Enforcement should ensure stop areas remain unblocked by parking or loading. Platform length includes length of the bus plus 10 feet of clearance from back of vehicle to crosswalk. Through-traffic, including bicycles, is directed straight, to the left of the bus zone, while buses transition across the bike lane to the right. 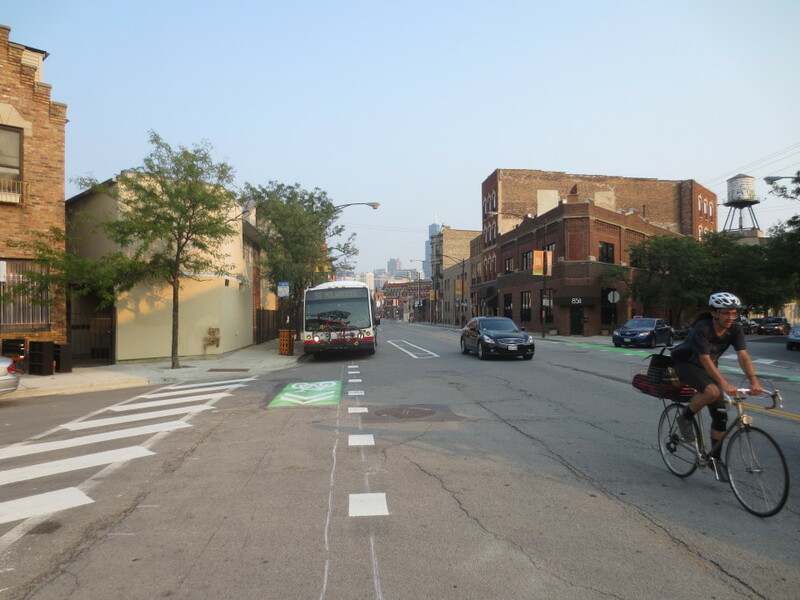 The bus stop lane must be wide enough to ensure buses do not extend into the bike lane. Use conflict-zone markings to position bicyclists to the left of the bus zone. Mark the bike lane to the left of the bus stop; place the seam of the concrete bus pad to either side of the bike zone, as seams and cracks pose a hazard to bike wheels. The bike zone should be at minimum 4 feet wide (refer to the Urban Bikeway Design Guide). 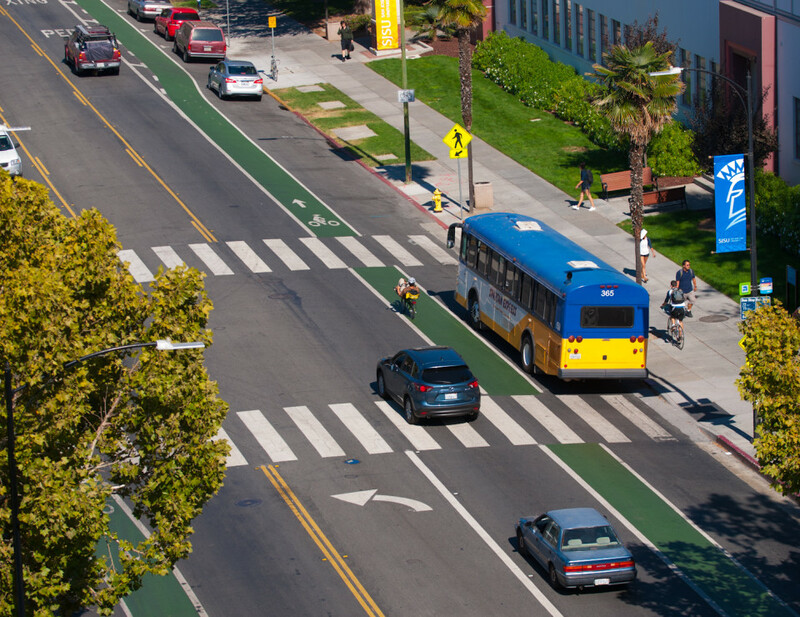 At signalized intersections, a leading bicycle interval allows bicyclists to continue ahead of buses pulling over to the stop, but may add transit delay. References for Curbside Pull-Out Stop: 5 found. Leif Dormsjo. "Revised DDOT Sidewalk Installation Policy." District Department of Transportation, Washington. Barr, Joseph, Jordan Beveridge, Carl Clayton, Alan Danaher, Jack Gonsalves, Bob Koziol, and Sean Rathwell. 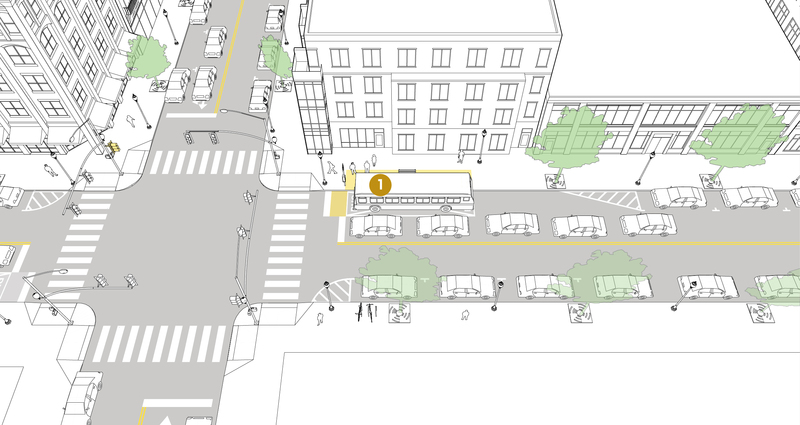 "Designing Bus Rapid Transit Running Ways." Bus Rapid Transit Working Group, American Public Transportation Association, Washington. New York City Department of Transportation. "Street Design Manual, 2nd Edition." New York City Department of Transportation, New York.
. "Streets and Sidewalks Maintenance Standards." Department of Public Works, City & County of San Francisco, San Francisco.